This month's Accretionary Wedge theme, as described by Anne Jefferson at Highly Allochthonous, our host, is "Back to School." The theme is fairly broad, with topics or questions for geology students, geology professors and geoscience teachers in general, industry folks like myself, and all geoscience enthusiasts. First of all, I'd like to encourage everyone who gets into geology to follow your own path, wherever it may take you. If you are the sort of person who likes to plan things out ahead, do so; if you like to follow your nose, do that and don't look back. Some people have asked me what industry needs or wants. I can only attempt to speak for the mining and minerals exploration industry, and can't speak at all for the petroleum or environmental side of things. What we "need" in the mining industry isn't necessarily anything a student of geology can plan on. Things change. If you want to aim in our direction, do get into it for your love of geology, your love of minerals and ore deposits, and your love of discovery. Discovery is what we do. Or, get into it for the wonderful opportunities to study complex structure that you will find at every mine and prospect. Structural preparation is often integral to the formation of ore deposits. If you are outside academia… what needs do you see for the rising generation of geoscientists? What skills and concepts are essential? Are there skillsets that we aren’t doing a good job of imparting on students? How important are things like communication and quantitative skills versus specific knowledge about rocks/water/maps? If you could go to a group of undergraduate geosciences majors and give them advice, what would you tell them? What would you tell their professors? made me think of a few things. So follow a few random thoughts. First, I don't know where geology in general is heading, what kinds of geologists will be needed in the future, or in what numbers. For mineral exploration geology, I do think that in the forseeable future a background in mineralogy and petrology will still be needed, along with increased need for experience in certain types of computer programs (various GIS and modeling programs). Some of these programs can only be learned on the job or through short courses. Field experience is valuable, and will hopefully remain so, otherwise we will end up with a generation of modelers who have never looked at what they are modeling, something a sane world should not want. Although I've seen hints of this type of thing happening here and there and every now and then, senior-type geologists have been, so far, stepping in to keep things on track. The need for good communication skills can never be understated. Today, a lot of on-the-job communication is done by cell phone and email, but knowing how to write a good report, long or short, is quite valuable, a skill that is often overlooked by geologists, a skill that could often be improved upon. At the very least, you will have to be able to communicate to management — people who are not always geologists — why you need the money, why your recommendations for next year should be funded. This communication will often be both written and verbal, the latter being given to groups in slide presentations. When I taught Op Min and Petrography/Petrology (including all or most of the basics of the non-lab portions of those classes), my co-T.A. 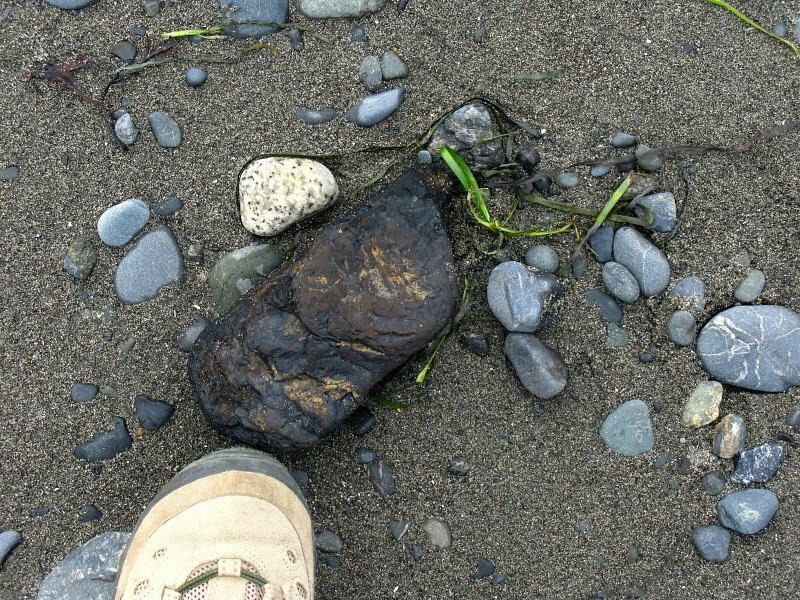 and I required "Rock Reports" about rocks and their accompanying thin sections, mostly to let students practise their writing, and to help them realize they would most likely have to write similar short, descriptive to interpretive reports or memos on the job. We graded down for misspellings of rock and mineral names, and we graded down for left out mandatory rock-report sections (I don't remember what format we used). Spelling is now easier, perhaps, because of Word and Google; good sentence construction is corrected only approximately and often incorrectly by Word. A thesis is a good place to get some practice writing in the standard scientific format. I recommend seeking out someone who will give good editorial feedback. Another thing that comes to mind is all the black box type of data collection and data creation tools that are available now, including portable XRFs. These devices in particular remind me of the tricorders used on Star Trek. Point the thing at a rock, and it will tell you all you need to know. Anyway, the point I'm working towards is that a good geologist will not be out in the field just collecting numbers with any type of device or black box, although we certainly do that with portable XRF devices, PIMAs and TerraSpecs, and various types of geophysical surveys. A good geologist will need to know when the numbers don't make any sense and why. And you will need to know what those numbers mean and what you might do with them. For example, if you are going to believe a tricorder that tells you you've just discovered the next Mother Lode, but you don't know how to recognize common and less common associations — minerals such as fuchsite, types of structures including veins, faults, and suture zones, and general and more specific rock types such as greenstone and grey ore — you might be disappointed when chemical (real) assays come back. You will sometimes be disappointed looking for new ore deposits, anyway, but relying on any kind of black box with no way of evaluating the results it hands you is a sure guarantee of disappointment. So, I say, learn the basics, which include rocks and minerals, and learn basic field mapping skills. Especially learn how to find out things you don't know. Ask questions, try to find answers. Learn to be an observer of all things, and learn to look for things that are unusual, things that might seem out of place but are there anyway, and things that might be there but are obscure or hidden by other more obvious features, textures, or structures. Becoming a keen, trained observer will hold you in good stead through your entire geological career, and in life, no matter where you might go. UPDATE: Accretionary Wedge #38 is now up at Highly Allochthonous! It was a busy summer, and now with fall here, I'm once again about to go back for another work stint, which for me will involve working about 18 days in a row, depending on a few unknowns. Last month, for various reasons, I wasn't looking forward to going back to work after my days off; this month I'm merely a bit tired. In the middle of my typically long work stints, if I feel I've gotten into a bit of a rut, I will often have to renew myself, usually by refocusing my mind, sometimes by something as simple as a hot bath (no hot springs are currently handy). A little burnout or rut development here and there is normal. What has been somewhat atypical this summer is the intensity of our days off, my 10 or so, MOH's 7. I usually spend about one day (sometimes two if I'm lucky) getting ready for days off by catching up on home paperwork and chores, by getting laundry done, and by running a few errands. Then, off we go. The where is usually a great place, and although the where sometimes involves chores of other kinds, the where always involves some needed relaxation. 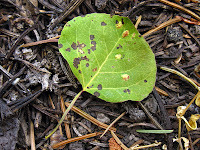 This summer has included two major trips, Alaska and a camping expedition to Wheeler Peak; these trips have been rewarding, enjoyable, relaxing, and offtimes intense. The comings and goings related to these trips — and to smaller trips like one earlier this summer and one earlier this month — always involve getting ready, and the return always involves unwinding from the trip and getting ready to go back to work, often with more paperwork and chores, more laundry, and more errands, giving the whole several days a symmetry of sorts. These last four months have felt time or event crowded to me, with every day off for both of us seemingly scheduled in advance. Oh yes, we have had time to stop in Middlegate, time to ride our mountain bikes, time to hike to the Pony Express Station (maybe twice! ), time to stand in the river and fish, and time to stare deeply into several campfires. We've been fortunate in these things, and in having opportunities for travel, even when some of our travel has been done to accomplish chores and repairs of various kinds. We have also been fortunate in having two jobs, and two cars in which to get to those jobs. Our jobs start at different times of the day; we sometimes pass each other on the road, one coming home from work while the other is going. We wave at each other or flash our lights. The other week, my truck broke down in front of our little house, fully blocking one of the roads. After trying a few things and getting out the shop manual — hurriedly, because we didn't know what we were going to do if we couldn't get the thing started and dusk was threatening — we determined that the fuel pump, located inside the gas tank, was kaput. I called the emergency number of the place that usually works on my truck; the owner recommended a towing service. I called them, they recommended another outfit. That guy came over immediately, pulled my truck onto his tow truck while neighbors watched, and hauled my malfunctioning truck off to the auto shop. He dropped the truck and keys there (after hours), and delivered the towing bill to my insurance agent the next day. Two days later (a colleague drove me to work and back while I was sans truck) I had my truck back. Yes, it was the fuel pump. A few days or a couple weeks later, while out camping miles from anywhere but Baker, a town of minimal services — card-reader gas station, a couple motels, a place to get showers, a place that sells firewood for camping, and an operating cafe-bar with small general store of the mini-mart variety — the other car, our Prius, broke down in a way that left it somewhat driveable, driveable only because of its strange hybrid system. We finally determined, after replacing most of the coolant, that the "fan" belt to the water pump had broken or come off. The Prius is not an easy car to work on without a full lift, and it has very tight spaces around most of the parts that one might want to work on, including the belt. We were able to coast it down to Baker without it overheating, and with me driving another vehicle loaned to us by our campmate-SIL. We pulled the Prius into the card-reader gas station, drove the other vehicle over to the cafe-bar. Baker has no cell service. 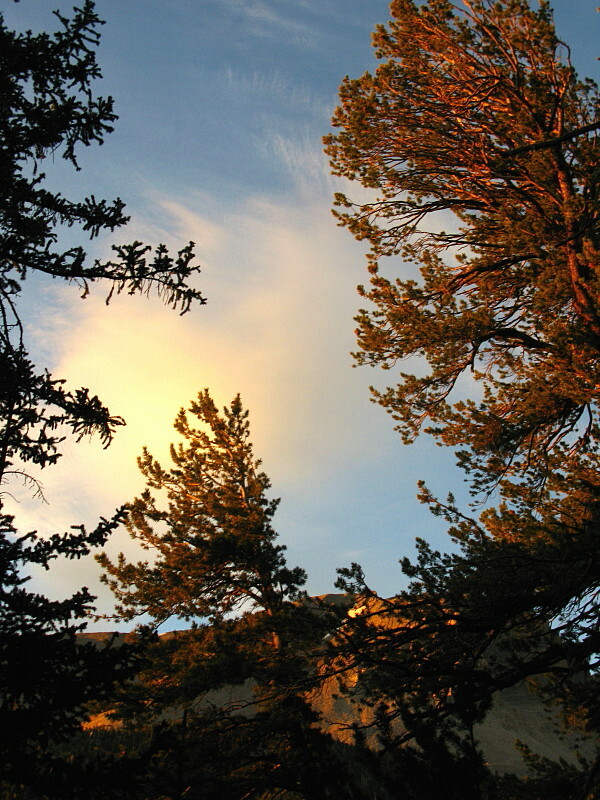 No place near Baker has any usable cell service whatsoever, although I got sniffs on the mountain above 8500 feet. 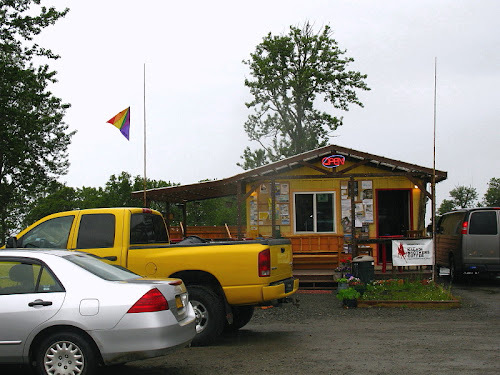 We were able to use the landline at the bar to call the number of my auto shop (which I had on my not completely useless cell phone), and were able to find that they were probably the only place for hours that could work on a Prius. So we called the same towing company, met the tow truck by the Prius a couple hours later, and had the car dropped at the auto shop. We drove SIL's vehicle back to camp. We stayed overnight, packed up camp the next morning, drove in and unpacked, then picked the Prius up at the shop. Yes, it was only the one belt, the one running the water pump. It has seemed like a bit of a marathon summer, perhaps fall will be more steady-as-she-goes. It's Banned Book Week today through October 1, and Dana at En Tequila Es Verdad has, as is her wont, created a banned book meme. Her list is from here, her rules: "I've highlighted the ones I've read in bold. Feel free to do the same, my darlings - and do treat yourself to some delicious literary contraband this week." I recommend all the (few) books I've read on this list. All the rest warrant checking into, at the very least. ...Free Access to Libraries for Minors, an interpretation of the Library Bill of Rights (ALA's basic policy concerning access to information) states that, “Librarians and governing bodies should maintain that parents—and only parents—have the right and the responsibility to restrict the access of their children—and only their children—to library resources.” Censorship by librarians of constitutionally protected speech, whether for protection or for any other reason, violates the First Amendment. I'm going to depart a little from my usual "X Years Ago Today" format and go with this post, a few days late, which follows on from my 9-21 Newark Valley post of last year. That way, I don't have to wait one more year! 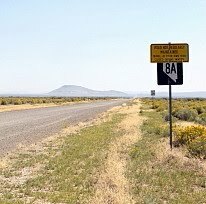 9-21-2007: After driving south from Highway 50 east of Austin onto old Highway 8A, now Nevada S.R. 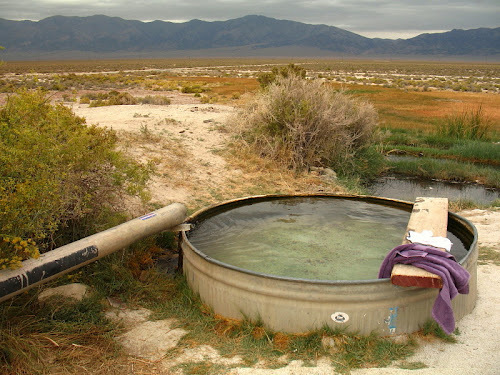 367, we stopped at Spencer Hot Springs and soaked briefly in a lower tub, one just below and west of the main spring. It’s a tub that MOH and I hadn't been to before, although it’s possible that I camped next to it a number of years ago while at the springs with NJ&O. The tub was well set up and was at a good temperature. From Spencer, we drove to old Highway 8A and then south to Kingston Canyon. 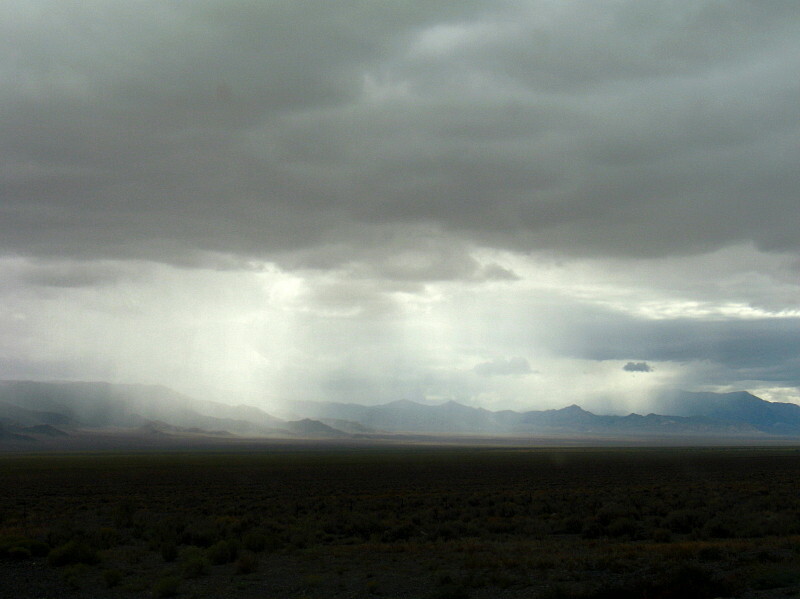 View of the Toquima Range from Highway 8A. We're looking across Big Smoky Valley toward the Northumberland caldera, with the wide, flat-topped mountain in the far right being Mount Jefferson, the sixth highest peak in Nevada, with the third highest prominence. 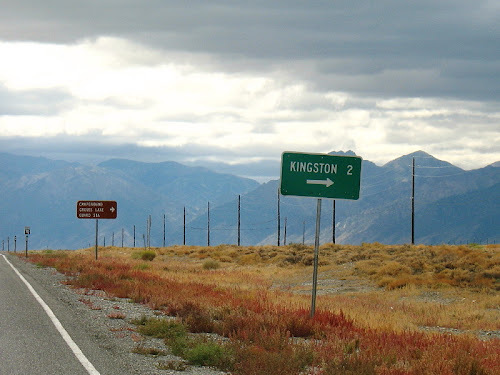 We wound through the small village of Kingston, driving by the rundown cabin I lived in back in '79 and '80, and by the land-uphill, takeoff-downhill dirt airstrip. The road meanders through town and then into Kingston Canyon. 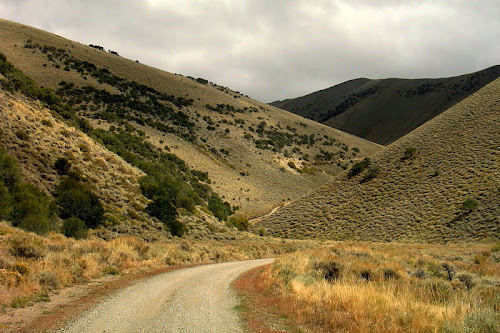 The Kingston Canyon road, a good graveled road, then goes through and under willows and cottonwoods, past a small lake or two, past a campground, a couple fishermen, and an old ranger station. Up ahead, the road switchabacks up to the pass. Just past the ranger station, the road crosses Kingston Creek, shortly thereafter making a broad turn to the northeast. After the turn, the road abruptly steepens to switchback through a rocky section, 4WD usually (always?) 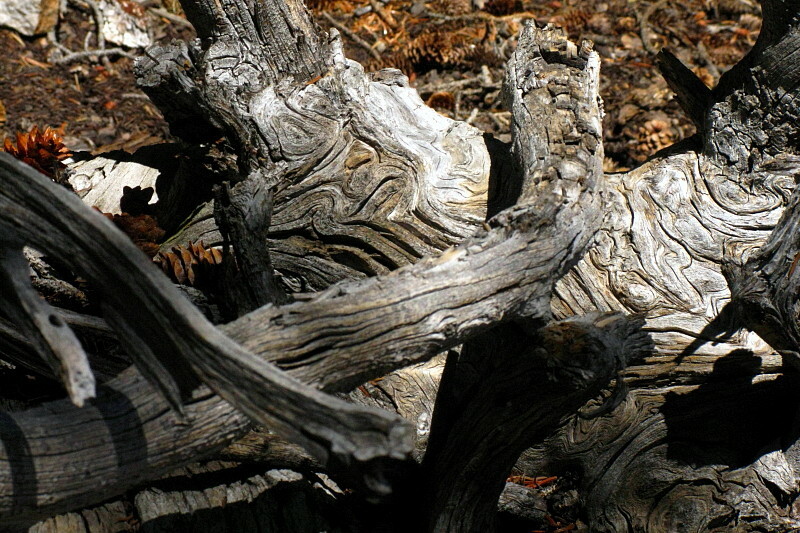 required, to the 8660-foot pass between Kingston Canyon and Big Creek Canyon. View northward from the pass between Kingston and Big Creek Canyons. 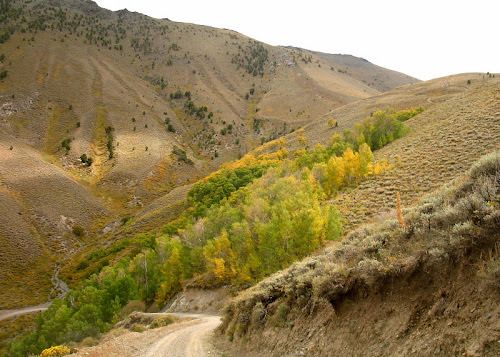 The road then descends less abruptly and with gentler turns into the southern high reaches of Big Creek Canyon—a long, north-south canyon full of aspens, scattered quartz boulders, abundant sagebrush, steep slopes, and a creek stocked with trout. 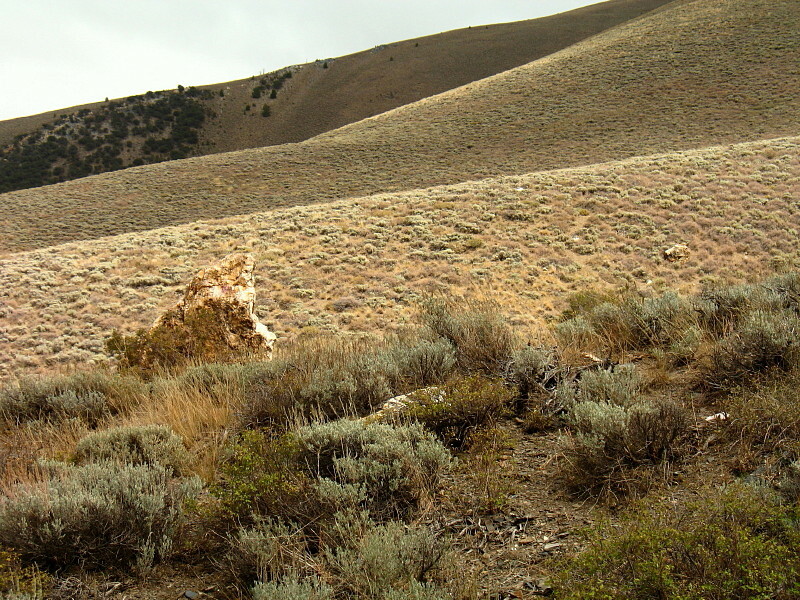 Quartz-vein boulders littering the west slopes of the 11,000-foot-plus Toiyabe Range ridgeline. One of the larger quartz-vein boulders. 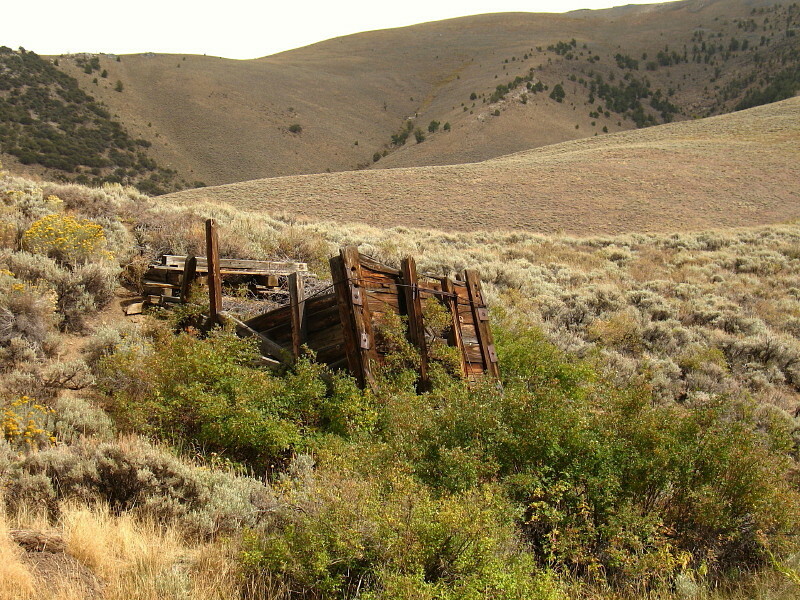 Old ore bin in upper Big Creek Canyon. 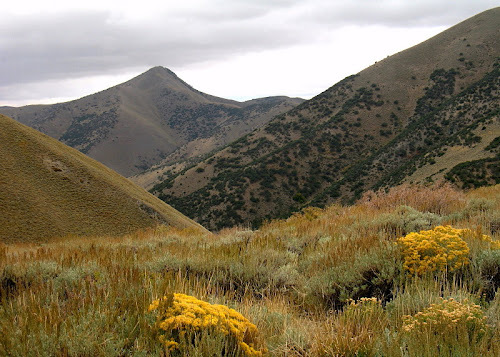 After passing Big Creek Campground, we drove out of the canyon onto the western slope of the Toiyabe Range above upper Reese River Valley. We then drove forthwith to Fallon, stopping only at Middlegate Junction to get a soda and snack. Middlegate Junction, as is often the case, was suffering a horrendous dust storm due to strong winds coming north up the valley from Gabbs. 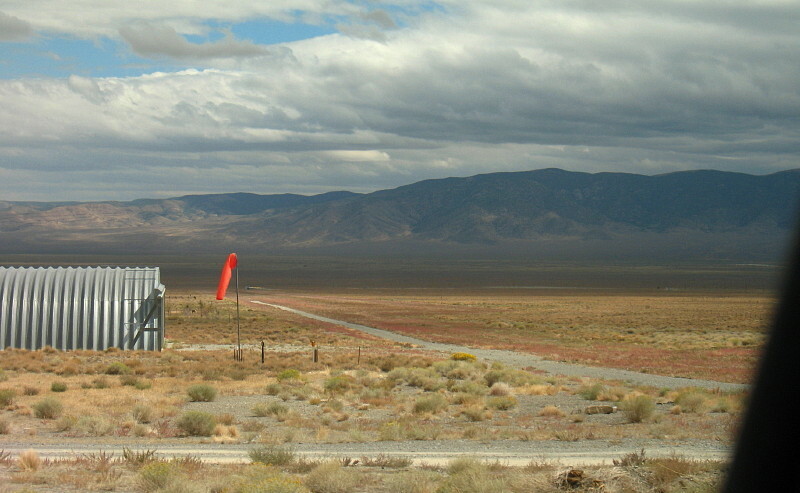 Wind was blasting Highway 50 at a perfect 90º angle. 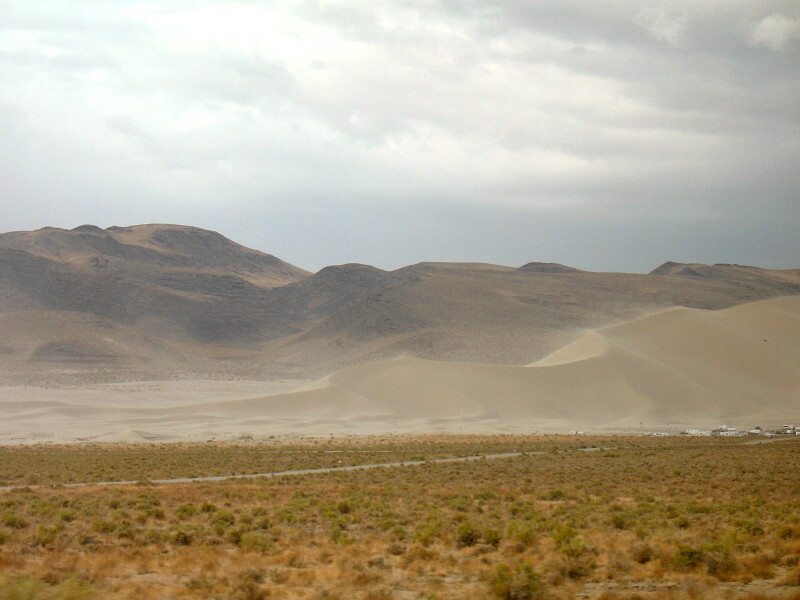 Farther on, sand was spraying from Sand Mountain, making life miserable in the RV city sitting at its base. We got a room in Fallon that night, then went for a fine Mexican dinner at a little cantina south of the main drag (Highway 50). The chips and salsa were excellent; the waiters and waitresses were dressed in black and white outfits like tuxedos. 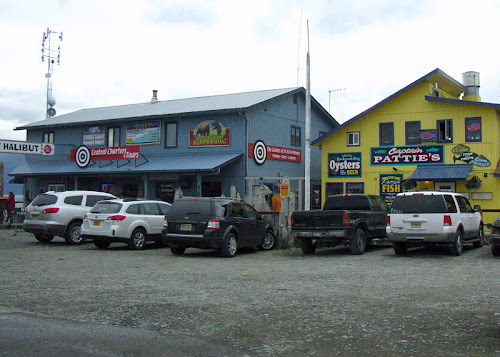 We had first dined there many years ago after retreating from a subzero winter trip to Spencer Hot Springs. 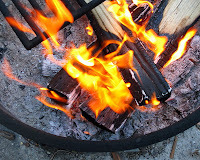 The temperature in Big Smoky Valley had been -18º F, and amidst unknown electrical problems, a moonless darkness, and a foot of snow, the heater in the camper wouldn't kick on. 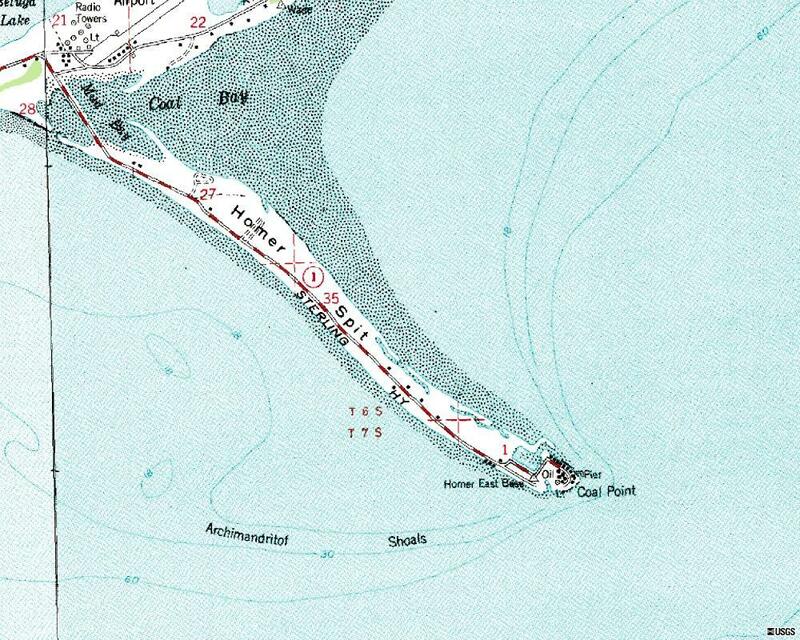 Fallon was the closest place for repairs on that earlier trip; it was a welcome stopping point four years ago. It was about a million years ago during the first couple years of my field geology experience, probably toward the end of a summer or maybe it was early fall. A field trip was concocted to show some of the immediate mucky muck types around a property I'd come to call my own — a huge claim block centered on one of the major Tertiary calderas (Tertiary then, Paleogene now) of central Nevada — although I wasn't on the ground or anywhere near it when the discovery was made (nor was I there when the caldera formed way back in the early Oligocene). The guys (all guys except for me) were mucky mucks to me at the time, although at least a few of them probably didn't think of themselves that way: my boss, my boss's boss, and some new guy with distinct mucky muck potential who would later go on to run exploration departments and such. We drove up the main dirt road, with me leading in my burgundy Bronco, a company truck that had been assigned to me that year. At least one other field vehicle was following me, maybe two or three. The truth is, I ran more than one field trip up that same canyon over the course of three or four years, showing various people around the area for various reasons, and the many field trips blend together in my mind. Consequently, I don't remember exactly who was on which field trip, save for a key few people on a few key trips. I was nervous; maybe the boss was riding with me, perhaps he was in his "Boss Mobile" (not exactly the phrase we used) behind me. I didn't want to go too fast or too slow. I didn't want to hit rocks or ruts, I didn't want to slide sideways around curves or in any other way look like a foolish or inexperienced young geologist. I slowed down as the caravan I was leading approached our area of particular interest: a volcanic breccia, possibly a breccia pipe. I pulled over to the left side of the road; everyone else pulled in behind me. At that point, we all jumped out of our various vehicles, suited up with Filson vests (if we didn't already have them on), grabbed rock hammers from beneath seats or from backs of trucks, and crossed the main wash northward over to the cliffy bluffs exposing the breccia. It was quite an enlightening field trip for me, with lots of proclamations made about what should be found in breccia pipes as opposed to flow breccias, and gradually some determinations were forthcoming. 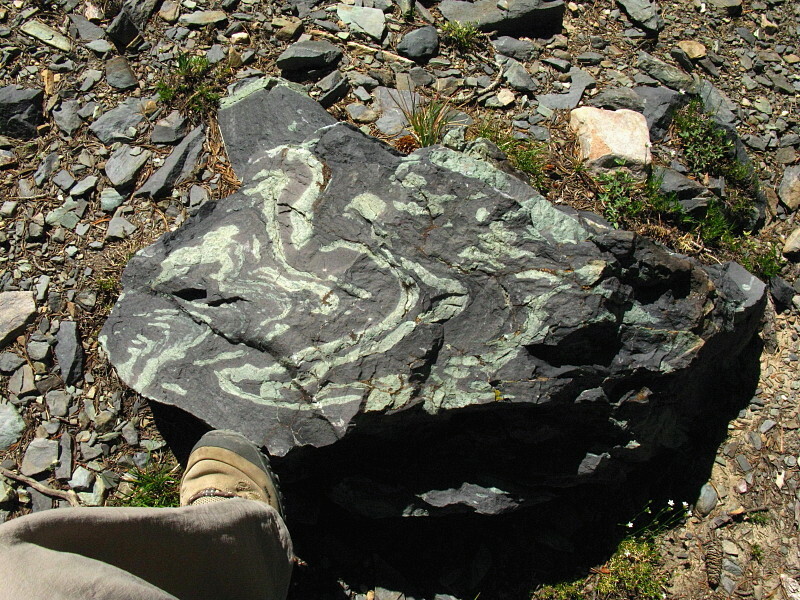 The matrix of the breccia, highly siliceous, dark, and very fine-grained, was hot when the breccia formed. It had plastered itself onto the breccia fragments such that one could hardly separate fragment from matrix. Some possible sedimentation in the upper part of the main exposure was noted, leading thoughts towards more than one eruptive or explosive event, with some settling downward into the proposed pipe. Flows going outward from the vent or pipe were identified; a thick flow breccia near the vent thinned laterally to one main one and a couple or a few thin ones above it. Samples were grabbed: hand samples of one of the best breccias in the world (well, in Nevada at least). Everyone wanted a large chunk of the breccia matrix, which contained small chunks of fragments grading downward to rock flour. Large chunks of matrix were hard to come by: all large chunks, when broken, revealed giant fragments only thinly coated with matrix. I'll dig up some pictures sometime, although my memory is much better than the pictures I took a couple years back, or maybe all the best samples are in personal collections made that day, or housed in unknown warehouses. We walked back to the trucks. Oops! I had left the keys to my Bronco in the ignition and had locked the doors. (Many field trucks are left with keys in ignitions, windows rolled down, and doors unlocked just to prevent this type of occurrence, and because dirt roads in Nevada are generally considered safe, or were back then, from truck stealing.) I was quite flustered and embarrassed, and it looked like the boss thought I was a complete idiot. The new guy, who would become a longtime friend and colleague, and later an exploration manager, immediately started looking around the side of the road and wash area and, voila!, came up with some sturdy wire. Without saying a word, he walked over, bent the wire into the right shape, slipped it under the rubber of the driver's side wind wing, hooked it over the little metal pin that was designed to be used to open and close the wind wing from the inside, and pulled hard. That broke the mechanism that would keep the wind wing shut and in a "locked" position. The door handle or window crank could then be accessed; the the door was unlocked and opened. Busting the wind wing locking pin made it impossible to get locked out ever again. One or two of the field trip participants admitted it was one of the first thing they would do upon getting a new vehicle: bust the wind wing locking mechanism. We don't have wind wings on trucks anymore for that very reason. It was a lesson I never forgot: I sometimes busted the wind wing pin on new company trucks preemptively, even though I'm not prone to leaving keys in ignitions, and I always had sturdy wire easily accessible in the back of the truck. And yes, I have used that trick at least one or two other times, whether on my truck or on someone else's. Discovery of the flotation method. 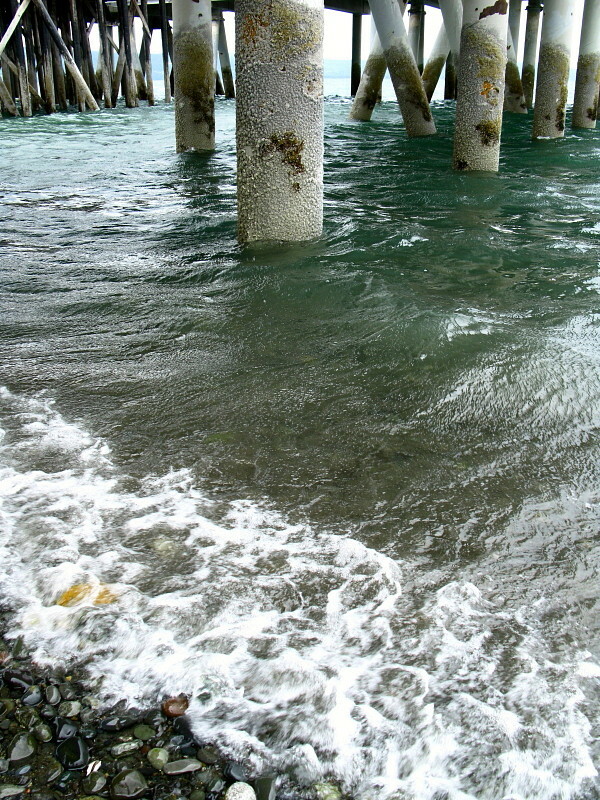 Glacial silt in turquoise blue water. More about the Earth's shadow & Belt of Venus. And surely there are others. 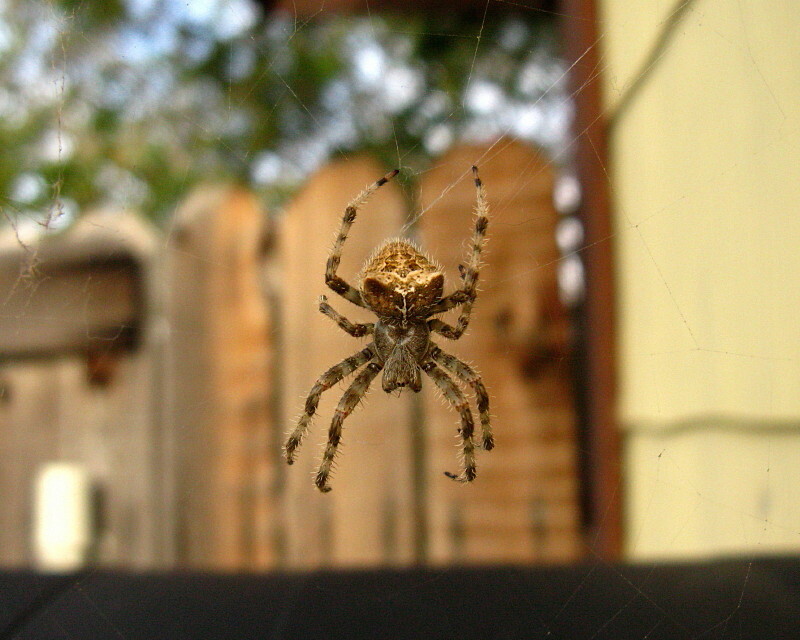 This spider, a type of Orbweaver, has taken up residence just outside our front door. 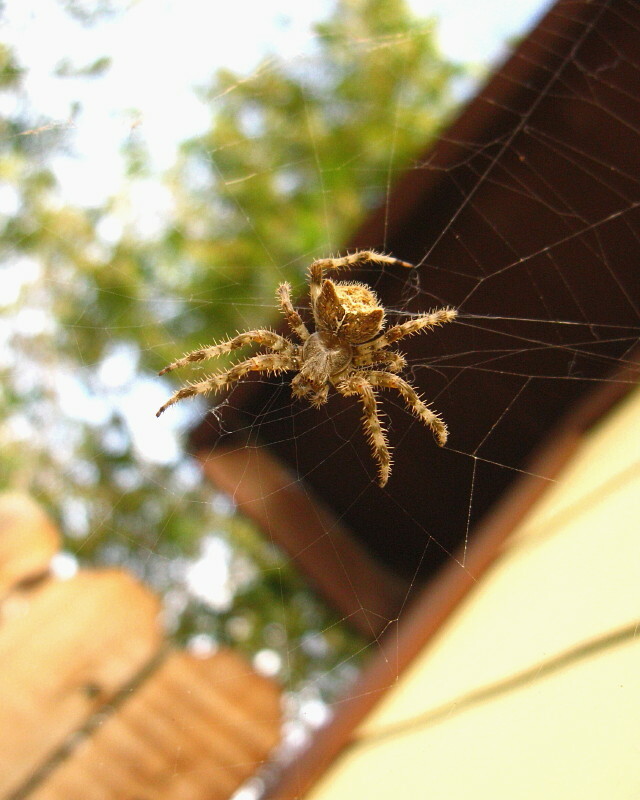 When I moved in to try to get a closer shot, it moved over, taking a cockeyed stance on its web. I decided not to bother it any further. 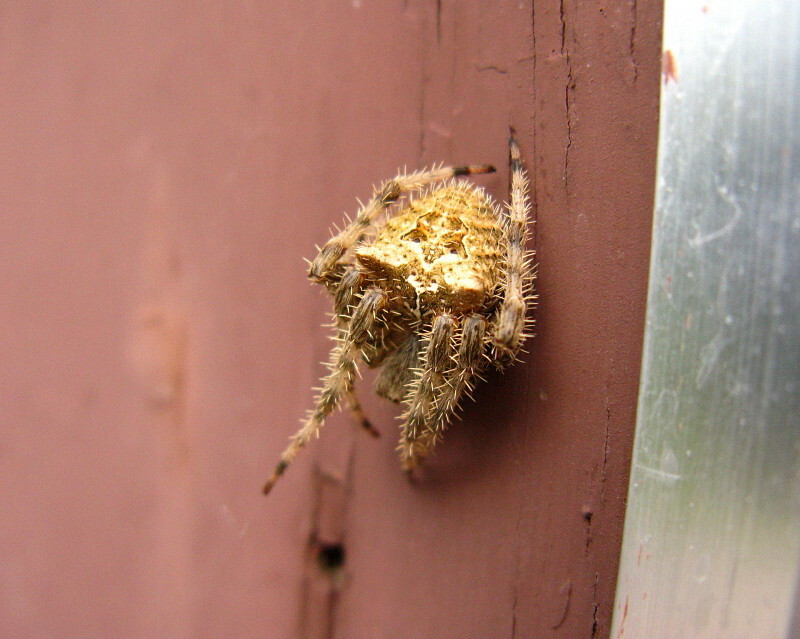 The next day when I went out for mail, its web, which had been attached to the mailbox, was gone, and it had retreated to the wall right next to the door. 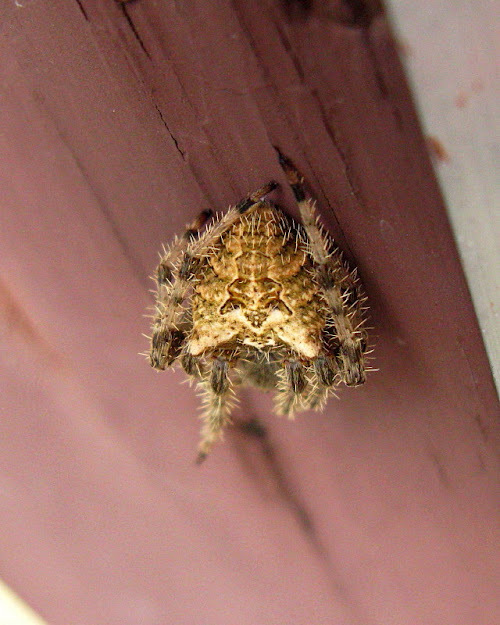 This is a cat-faced spider, Araneus gemmoides, and I think you can see the little cat face from this straight-overhead angle. Our spider has now formed a new web, high above the door in the eaves, with a few strands still attached to the mailbox. 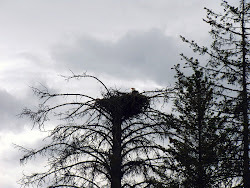 Hopefully it won't be disturbed in its new location. 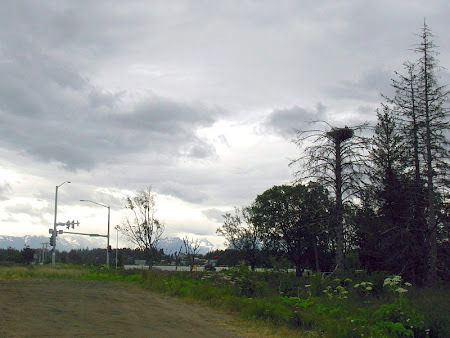 As we were turning away from the Homer Spit, we spotted a group of cars pulled over, with people running out to take pictures of the large eagle's nest in the top of a dead tree. 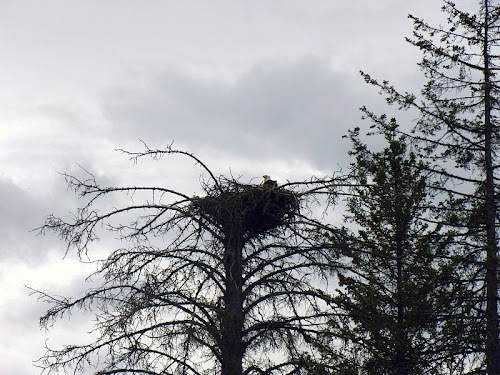 The nest held one juvenile eagle — hard to call them babies when they are nearly fully grown and probably about to fledge — and the adult in the picture (Mom? Dad?). Whereas I did get to see the juvenile, I couldn't get a photo. 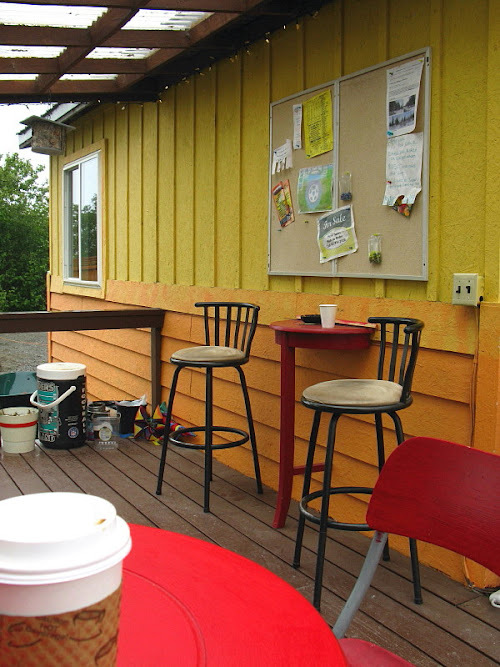 On the way back, in or just south of Ninilchik, we stopped at one of our favorite coffee places, The Buzz Café, one I've only been to once before which rapidly became a favorite because of its great coffee, convenient location, and colorful character. The covered sitting area makes it possible to enjoy coffee outside anytime of the year — or at least during the rainy season, not so sure about sitting outside during the snowy season. Breakup the event is marked by the "breakup" of ice in local rivers. In central Alaska, breakup may be defined at least semi-officially as the date, hour, and minute when the Tanana River ice breaks and starts to move downstream. Betting on the timing of this event takes place as part of the Nenana Ice Classic (Tanana, accent on the 1st syllable, is the river; Nenana, accent on the 2nd syllable, is the town.) Tanana River breakup dates through 2010 can be seen on the Ice Classic webpage; also see this NSIDC graph of breakup dates, which unfortunately only goes to about 2000. With our coffees still hot, we stopped briefly at the Russian Orthodox church on the bluff above Ninilchik Village, and I walked over to get this view of a muddy town and a cloudy Cook Inlet. And so ended our trip back from the end of the road, although we still had time and distance to go, and we probably made at least one stop prior to returning to our favorite spot on the river. I've been trying to join Callan's bug meme at least since June (also see Dynamic Earth), thinking I could get a nice shot of one of the beetles (Elm beetles?) 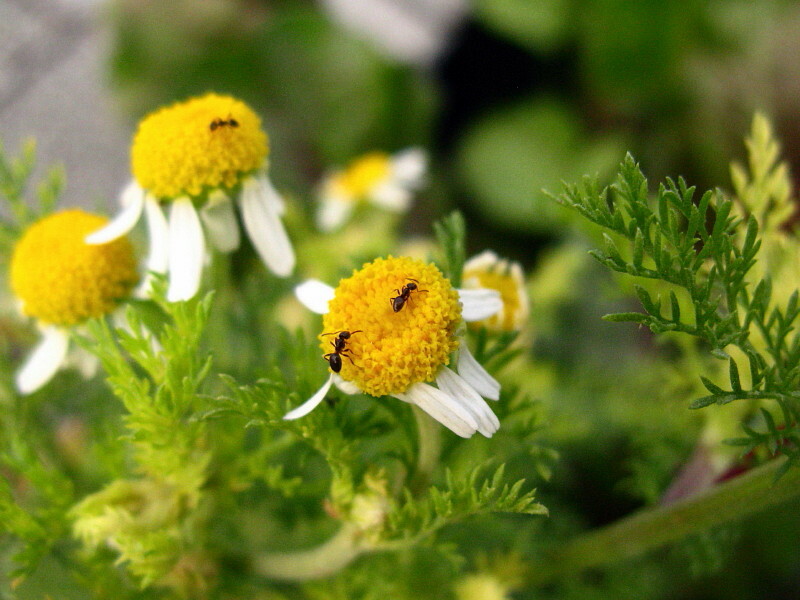 that perpetually come into our house through the summer, or get a sage beetle walking through the sage while out and about, but those things haven't yet come together. Finally, ants! These aren't true bugs, but they are arthropods (phyllum Arthropoda) of the insect type (class Insecta), in the family Formicidae. 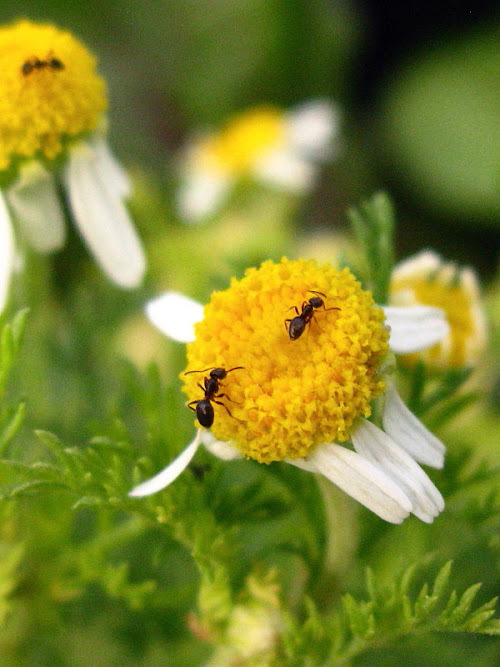 The closeup (1) and enlargement (2) were as close as I could get the lens to to this flower in our garden the other day, so these are tiny little ants. It was cool outside, maybe 45°F, and the ants were barely moving. After spotting the folds in meta-argillite up on Wheeler, I came across these distorted, fold-like growth bands in an old tree stump. 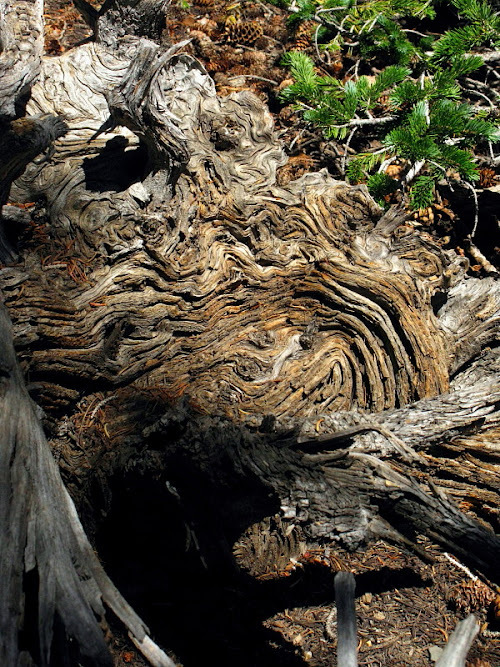 These "folds" are quite variable, ranging from gentle to tight. They are locally similar, broadly disharmonic. Maybe Callan could describe them a little better than that! Two small "folds" that are slightly overturned to the east. 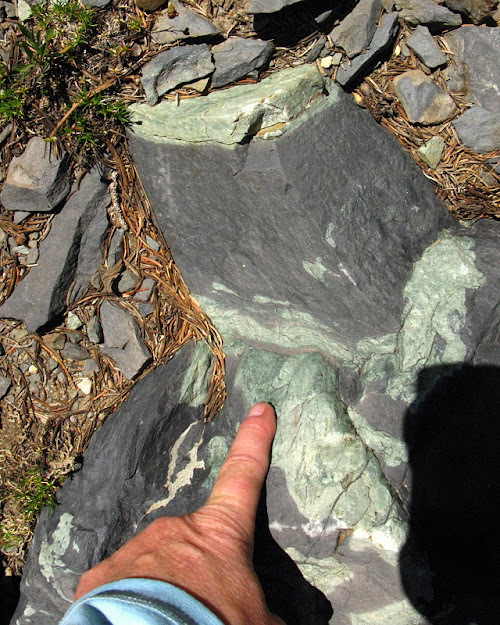 This is a small glacial boulder of folded meta-argillite, possibly from the Precambrian McCoy Creek Group, which I found along the trail between Stella and Teresa Lakes, beneath Wheeler Peak in Great Basin National Park, close to last week's boulder. The greenish, coarser-grained layers accentuate and define the folding, which otherwise would be more difficult to see in the reddish or purplish gray layers. Zooming in on the small boulder, I'm poining at some crude lineations, which my finger roughly parallels. The green bed at the top of the boulder is also lineated. This will be a brief field trip report from an undisclosed place and an undisclosed time. In fact, other such field trips over the years, whether during or after work, might be worth reporting on occasionally, mostly sans photos. It was a sunny afternoon, approaching early evening, and several colleagues and I passed by some broken and brecciated road cuts while on the way to our various evening destinations, wherever they might have been. The purpose of the rather spontaneous mini field trip was to shoot the bull about the meaning of the road cuts and see if we could figure anything out—in other words, to get our creative thoughts flowing. Lines and crude cross-sections were drawn in the dirt on the side of the road, with less crude versions drawn in some field books. Our first stop was essentially a mess of fractured, broken, and shattered rocks showing varying degrees of iron-staining and oxidation. Some jarositic-looking, weakly clayey limestones formed a possibly arched, upper zone above more typically calcite-veined dark gray Devonian limestone cut by hematitic seams and hematitic fracture-fill fines. Discussions ensued about what iron-oxides were staining the rocks and filling in fractures. A reddish coloration—reddish brown to reddish orange brown—in a batch of rocks, sometimes present in broad areas or even over whole mountains, is supposed to be a good sign when one is looking for the upper oxidized to leached portion of a porphyry copper system — at least according to a few old-timers who told me about such things back in the late 1970s when porphyry copper exploration had come to a standstill after what turned out to be a long-term decline in the price of copper. 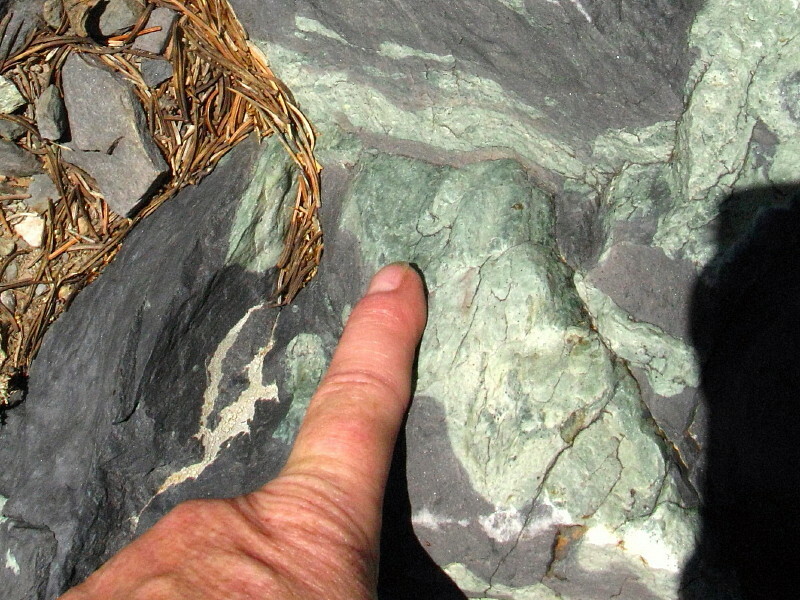 An Aside: A long time ago, Bear Creek or Minefinders developed a color triangle for determining the composition of various limonites or generic to mixed iron-oxides. Powdered pure or nearly pure jarosite (a sulfate containing iron that can form as a weathering or oxidation product of pyrite) was placed in a circlular spot in the upper corner of the triangle, powdered pure goethite was placed in the lower left corner of the triangle, and powerdered pure hematite was placed in the lower right corner of the triangle. Three other circles were placed between the three corners, each composed of 50-50 mixes of the appropriate two of the three main powders, and one circle in the center contained the three end members mixed together. To summarize the triangles main colors, jarosite is pale yellow to white when powdered or scratched, goethite is the typical dark golden brown of the average "limonite," and hematite is its typical reddish brown. I've looked high and low for an online version of this field cheat sheet that consisted of stiff cardboard with clear plastic- or cellophane-covered circles of powders with appropriate labeling, but have yet to find anything resembling the original. Perhaps I'll draw up something similar to the original and go further into this little exercise in crude field determinations sometime at a later date. For now, back to the field trip. I developed a question or two as we were standing beneath the large fractured to brecciated mass of structurally complex reddish to yellowish brown pile of carbonate rocks: (1) were we looking for copper and (2) doesn't the same guide to ore (red rocks and reddish color anomalies) also apply to finding porphyry molybdenum deposits? I also wondered (3) haven't red rocks been considered a guide to ore in at least some disseminated gold districts, for example at and around Florida Canyon? The answers: (1) maybe [seriously, what we were looking for was actually in question], and it is good to define what you are looking for without getting so stuck on what you've decided to look for that you can't see the possibility of finding something else, (2) yes, for sure, something I first learned from other not-quite old-timer types, also back in the late 1970s, and (3) well, of course, but not everywhere. Our impromptu field trip then moved down the road to stop number two, where a breccia of unknown origin was exposed in a particularly hairy road cut on a tight curve with narrow shoulder and the occasional speeding vehicle. 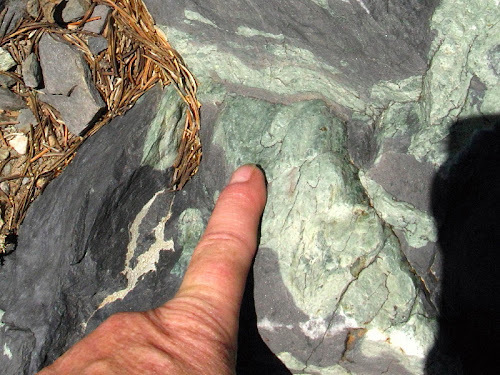 The breccia reminded me of the Titus Canyon megabreccia: mostly angular fragments of dark-colored carbonate rock were cemented by white, crystalline calcite. I thought it looked like a breccia of possible hydrothermal origin, one in which fragments had shattered but not moved far. It also looked a bit like a tectonic breccia, though no faulting surfaces were exposed. The expounder leading this part of our field trip said it could be a collapse breccia that formed over an oxidized massive sulfide deposit. 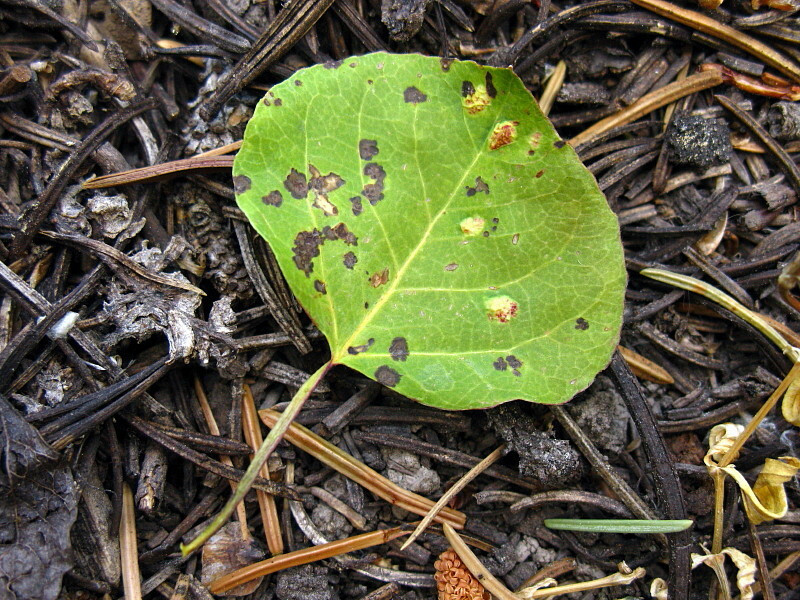 Oxidation of sulfides produces volume loss, leaving a potential collapse waiting to happen. I'm not sure how the calcite gets into position to cement the breccia together, it somehow having to push the fragments apart to exploit the collapsed zone, but some long, thin beds of shaly limestone could be seen to be sagging downward in a couple places, testifying to possible collapse. Perhaps the breccia was really fragment supported instead of apparently matrix supported, in which case the calcite could have moved in later with groundwater or low temperature hydrothermal waters of some kind. Resulting major questions arose from the two field trip stops and all the bull that was being shot around. One major one that was oft repeated: Should we drill here? Or there? Or over there? Everyone wanted to choose their own drill hole or two and locate them in specific favored spots. Another question: Should we sample here? The answer to that question? If you have to ask the question and don't just pile in with your bags, labels, and rock hammers, the answer is an automatic yes. Conclusion: get on with it! ASAP. And so ended a spontaneous early evening field trip to two undisclosed field trip stops, along an undisclosed highway, at some vague undisclosed time within the last 10 to 30 years. Torrent, José, and Barrón, Vidal, 2002, Diffuse Reflectance Spectroscopy of Iron Oxides (see page 1441 for Munsell color of some iron oxide minerals). 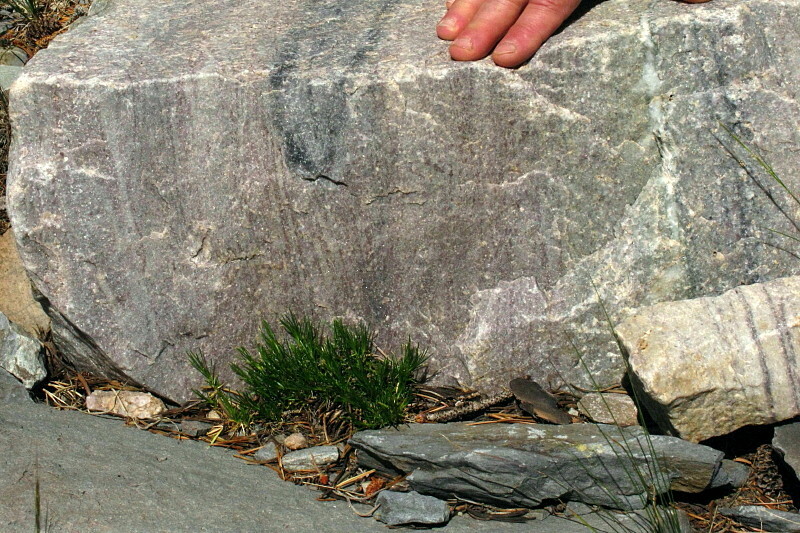 This small quartzite boulder, found in morainal deposits between Stella Lake and Teresa Lake below Wheeler Peak in Great Basin National Park, shows cross-bedding defined by dark purplish to reddish laminations. Up appears to be to the left. 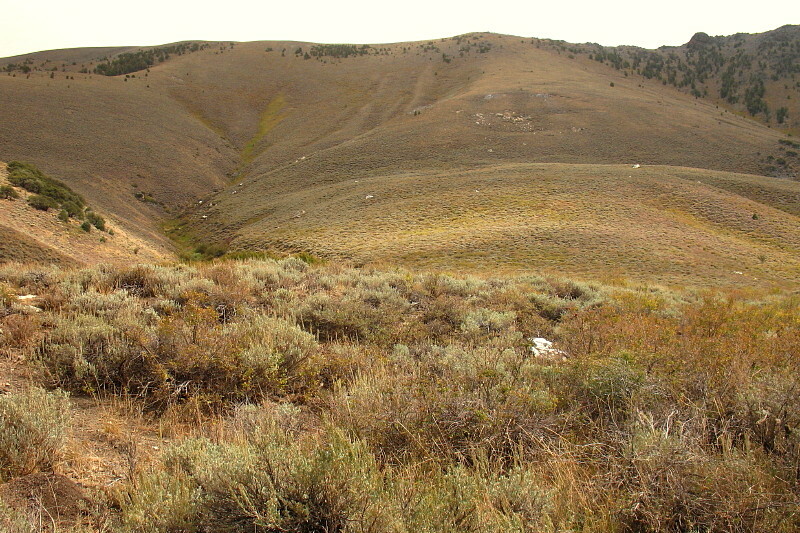 Without a stratigraphic context it's hard to say whether this quartzite is part of the late Precambrian McCoy Creek Group (pCMc) or the possibly late Precambrian to mostly early Cambrian Prospect Mountain Quartzite (Cpm), but most slopes uphill from this spot are in the Prospect Mountain Quartzite. Depositional environment was likely nearshore to offshore marine. 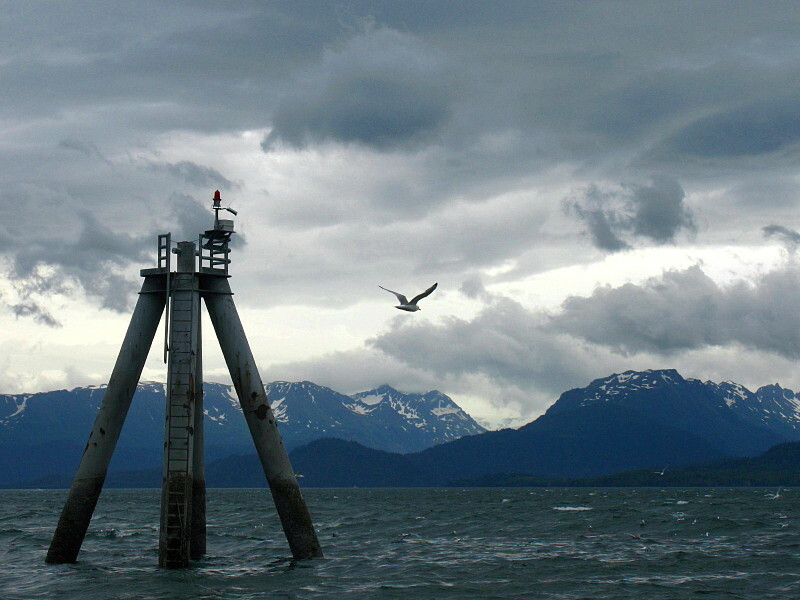 After leaving the little lunch spot, we passed this (faux) lighthouse indicating that we were progressing on to Homer Spit, where Alaska Route 1, the Sterling Highway, comes to an end. 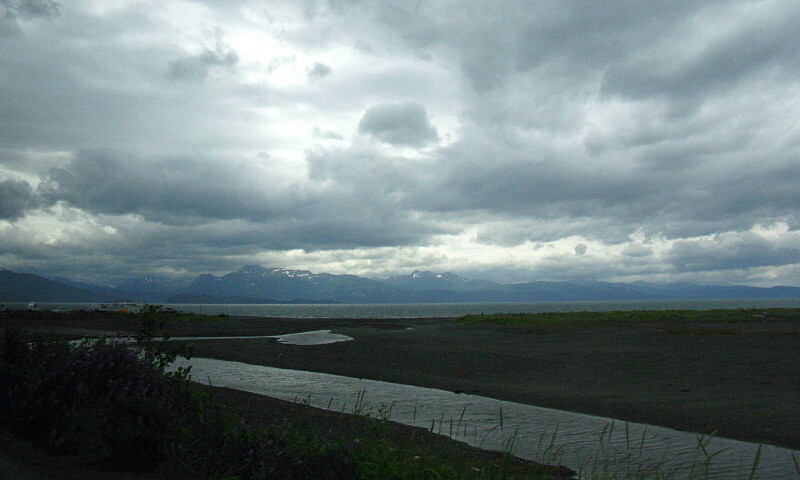 View of the Kenai Mountains across Kachemak Bay. It was still rainy as we entered the spit, and powerfully windy. Here and there, we could see signs of campers on the west beach, their tents and gear tied down and heavily weighted against the wind. 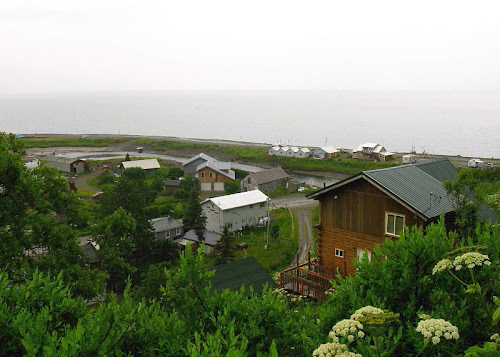 Homer Spit is a bustling tourist stop, with places to eat, places sign up for and go out on halibut charters, places to buy touristy things, along with motels, hotels, condos, and B&Bs, not to mention at least a couple scattered bars and saloons. 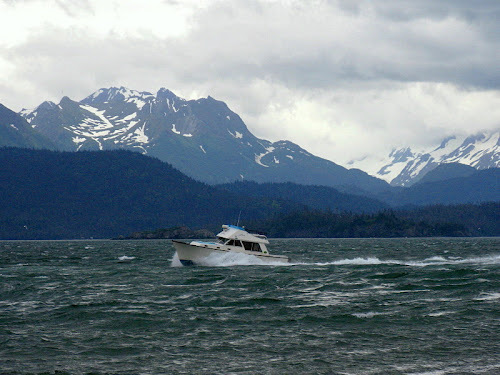 Over the many years of visits to Homer Spit, I've stopped here or there a couple times, mostly for suitable Alaskan lunches of halibut or such, but I haven't usually spent much time on the oft crowded boardwalks. 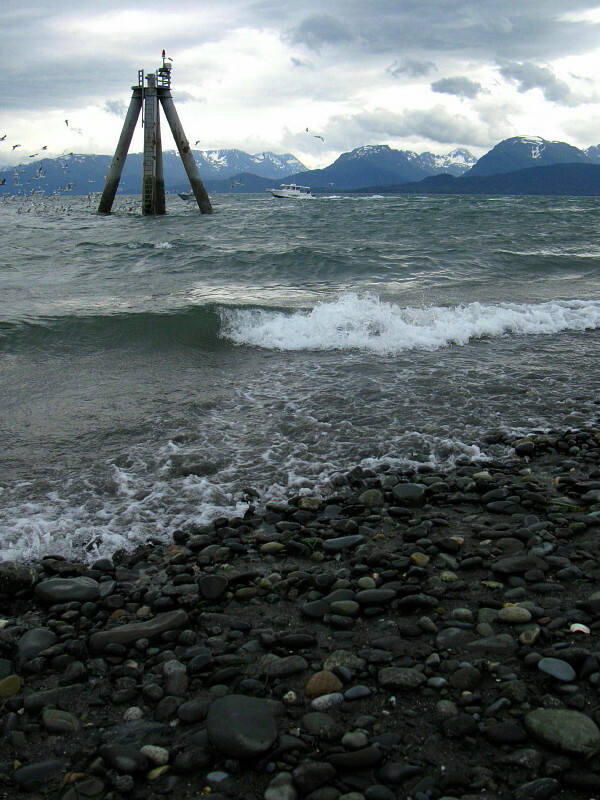 My mom and I were the only ones venturesome enough this time to walk down to the wet and windy beach. After a storm, or almost anytime the wind isn't blowing as hard as it was, the beach is a great place to find shells and other things. 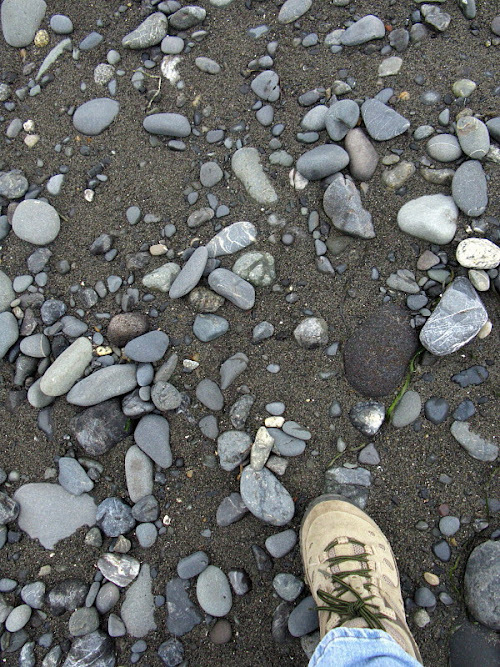 Here I've found lots of rocks, mostly graywacke, and not so many shells. There is one black lump of a rock just above my foot, which might be coal. I'll get to that after a bit. The beach is a good place to watch the waves, and to look at boats and birds. 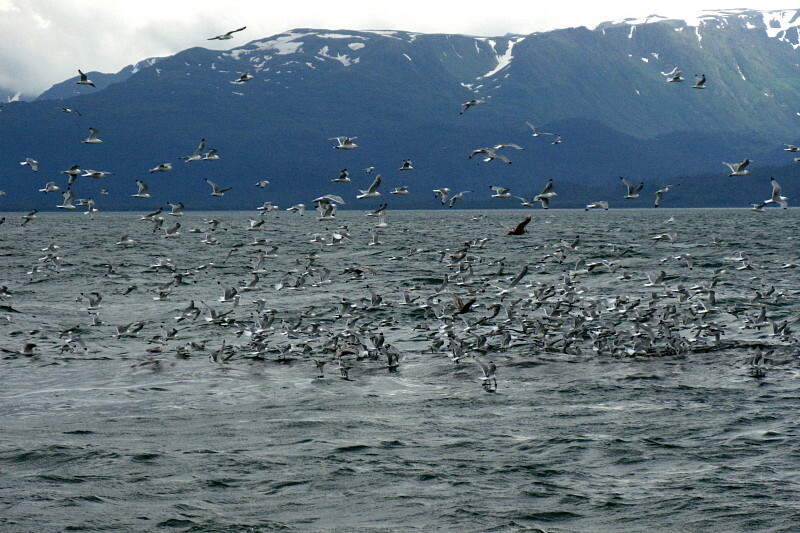 ...and lots of birds, mostly gulls. Down near the piers, you can sometimes find starfish frolicking in the waves or hanging out on the piers themselves. I've never seen this, but have found tiny living ones washed up onshore. After not finding any starfish, I notice the coal once again. Coal washes up on Homer Spit from a variety of sources, including some nearby seams of sub-bituminous coal to lignite found in bluffs cut into Tertiary sediments along the north side of Kachemak Bay. In fact, the Homer area was known for its coal resources long before the town was named in 1896 for con man Homer Pennock, who unsuccessfully promoted gold mining in the area for about a year before hightailing it off to the Klondike. 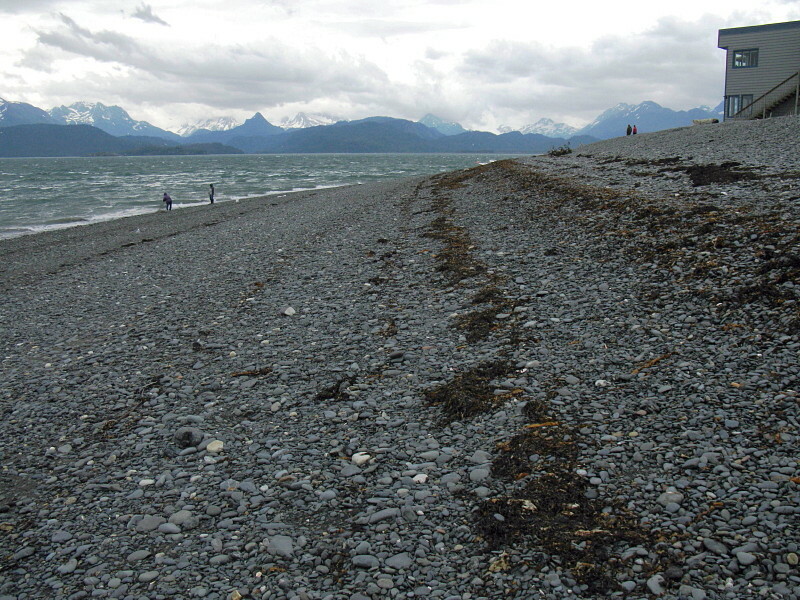 Homer residents still come to the beaches after storms to collect coal to burn. 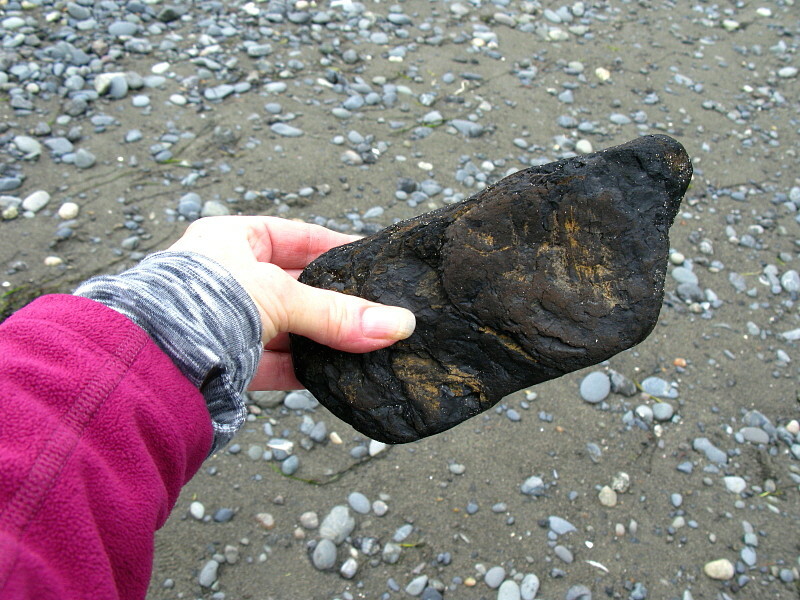 I leave the coal on the beach, and my mom and I retreat hastily to a drier environment: the car. 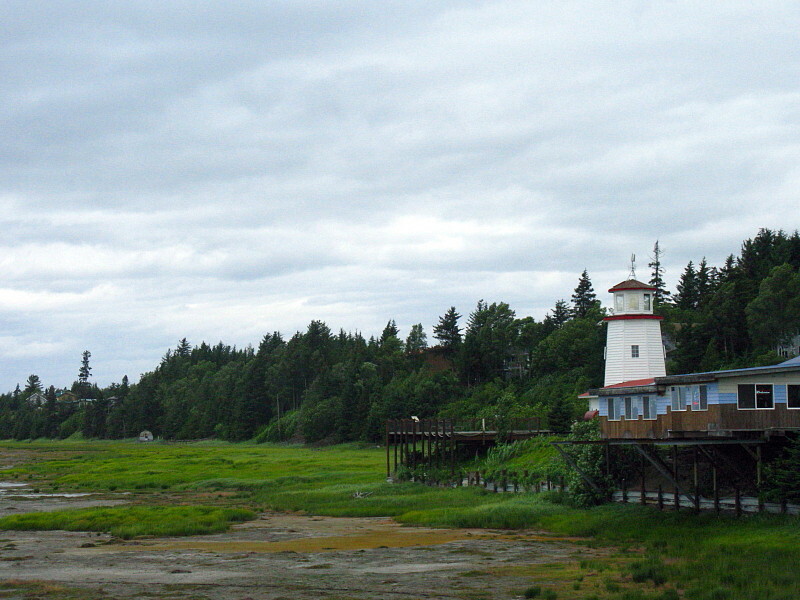 We head back up the spit. 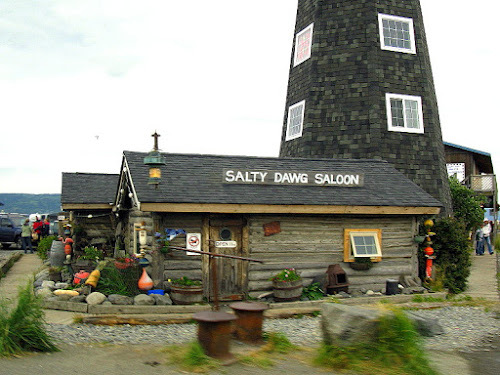 Here's a famous saloon I've never managed to stop in! 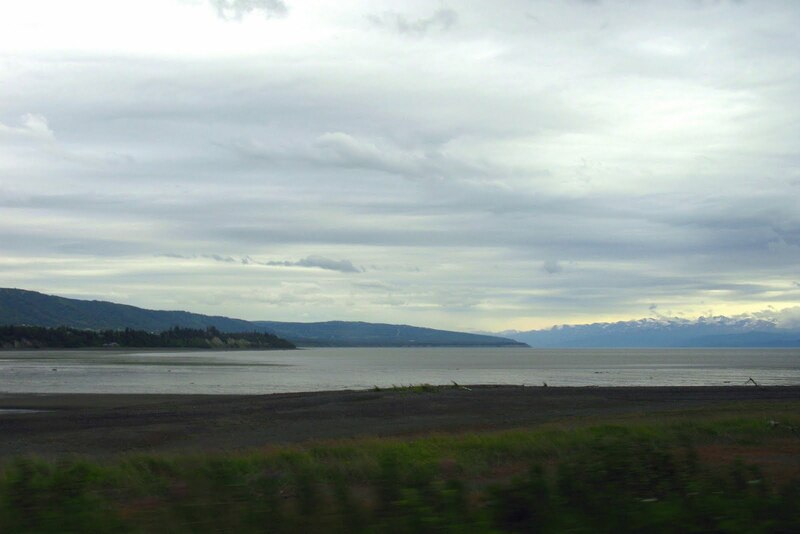 And we say goodbye to Homer Spit, Coal Bay, and Kachemak Bay. I wonder if the low, dark bluffs on the left expose low-grade coal beds.